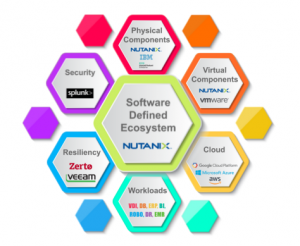 Previously in this series we discussed the Software Defined ecosystem vision which Cima Solutions Group has built around Nutanix in order to deliver the most complete and easy to manage infrastructure in the business. Today we will take you through our point of view on the Virtual Layer. What does Virtualization mean today? I think in most IT circles, virtualization is synonymous with the concept of delivering virtual servers on physical hosts. This is where VMWare made a name for itself almost 20 years ago. Fast forward to today and VMWare is still the clear market leader in this space at about 75% in the x86 space and 37% when you factor in midrange and mainframe systems, but a true server Hypervisor is merely just the ante to play. Today, the software defined datacenter drive is moving almost every physical component to a virtual model. For our clients, this means servers, storage, network, database, and even cloud. The overriding value proposition is no different than the one VMWare founded 20 years ago. It’s easier to manage infrastructure through a single software based interface, than individual hardware/controller based modules. Yes, this is still a space that is fairly important. While VMWare still has strong marketshare in this space, it is decreasing rapidly based on challengers such as Citrix, Microsoft, and now…Nutanix. Built into every Nutanix HCI stack is it’s very own Hypervisor called Acropolis Hypervisor or AHV. One might think this is a very generic toolset, but they would be wrong. In 2017 we did a POC for one of our clients to test the functionality of AHV against their existing VSphere setup to determine if there were gaps. This is a 700 VM environment hospital and thus we planned this for 6 weeks. Within two weeks it was clear that the gaps were minimal if almost non-existent. AHV is the real deal. Since this client was bringing in (8) new Nutanix nodes to go with their existing (24) we decided to forgo the additional VSphere licensing and instead move 25% of their nodes to AHV. This was a huge success with no issues to report a year later. This maps to the current Nutanix AHV landscape. 30% of all Nutanix nodes deployed today are running AHV. VMWare is still the leader in this space and has huge advantages with support and certifications by various application providers or ISVs. I suspect this will continue to change gradually as the ISVs add AHV to their list of supported hypervisors. As we first discussed in our introduction to the Software Defined data center, storage virtualization is really what drives Hyper-converged Infrastructure. The idea that SAN is expensive and complicated leads to Software Defined Storage. Today, Gartner recognizes only a few players in the upper right. There are several emerging in the other quadrants such as Scale Computing and Cloudistics, but as evidenced by our entire ecosystem, we believe strongly in the “Upper Right”. The three in the upper right are VMware VSan, HPE Simplivity, and Nutanix. We have experience with all three and understand why they are in the upper right. However, back to the original proposition and value point of HCI (integration which drives simplification), we see clearly that Nutanix has the most to offer here. It’s not just vVM storage in an HCI stack. They also deliver software based encryption, Block Storage, File Storage, Backup, DR and many other storage based functions through their Acropolis suite of software. VMWare has done a great job of moving beyond the hypervisor. In particular in the network space. Effectively, they have said, we did it for your servers, we can do it for your network. 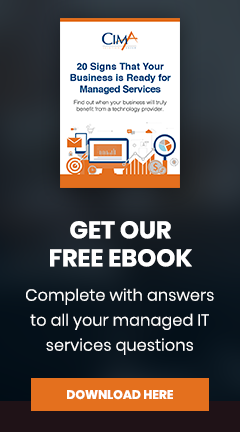 VMWare NSX delivers a software defined value proposition to the network including security. This has been in the market for a number of years. Recently, Nutanix announced Flow to their Acropolis suite. This is a nice challenger to NSX and again sits nicely in a single cloud delivery platform for Nutanix shops. Along with the Flow announcement, Nutanix also announced a couple of next generation virtualization products. The first is Era. Era is a virtual management system in Acropolis that allows you to manage all of your databases through a single pane of glass. DBAs today are challenged with managing thousands of databases, of different types, across various platforms. Era will simplify this dramatically. The second is Beam. Think about what I just described for DBAs. A new role is emerging in many companies now called the “Cloud Administrator”. Much like a DBA, a CA may face the challenge of managing many heterogeneous clouds. Beam offers the ability to simplify your cloud deployments through a single interface. Also built into the Acropolis foundation of Nutanix. In summary, we believe this layer is by far the most strategic. Virtualization equals integration equals simplification. That is what this is all about. Nutanix clearly has a very complete vision here.